One person don jump inside lagoon for Lekki toll gate bridge for Lagos Nigeria on Friday, for wetin look like im carry for mind to kill imself. According to authorities, dem see ATM card and other items for di place wey di thing happen. Video camera capture when di victim comot im cloth and shoe look around to see if anybody dey before im jump inside di lagoon. Officials for di Lagos Waterways Authority, di state emergency management agency and di marine police rush go di place to try rescue di victim. 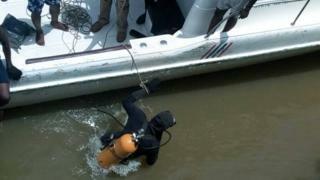 After four hours of search dem no see di body, and di officials don call off di joint operation. Di authorities still dey investigate wetin cause di victim to do wetin im do as dem feel say na suicide. Dis one dey happen six months after one medical doctor for Lagos - Allwell Orji jump from third mainland bridge enter lagoon kill imself.